I am located in S.E. Minnesota between Plainview and Kellogg. I have been raising horses since 1992. My first horse was a Paint yearling. A couple of months later, I bought a bred mare with Poco Bueno bloodlines. The next spring she gave birth to twin fillies. Unfortunately, one of them did not make it. My Quarter Horses consist of Poco Bueno, Doc Bar, Secretariat, Mr Joe Glo, and Impressive bloodlines. 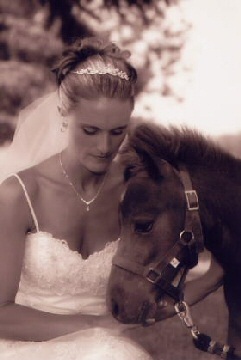 In 1997, I sold my Paint gelding because I figured out that breeding my horses was a lot better than riding them. From there, my dad and I went to purchase some miniature horses. The first time we came home with six miniatures, and a couple of weeks later came home with eleven yearling mares. At the time, I did not know about their pedigrees. I later found out that most of the yearlings had the Iowa's Little Kernal bloodlines and Flying W Farms Little Red Ranger. Also, the stud I purchased at the time had bloodlines that went to Orange Light Vant Huttenest. 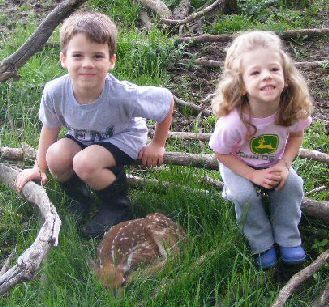 In 2001, I bought a couple of whitetail deer fawns and bottle fed them that summer. It was a lot of fun, but you have to be able to have time because they are like children. Along with the horses and the deer, on my family's farm we milk cows, have a motocross track, sell hay, and also make trophies for horse shows, etc. If you are interested in any of the things we do here, don't hesitate to call! Visitors welcome any time.